Over the last six months, the former manager’s house at Moscowa Cemetery (Waterbergseweg, Arnhem), has been refurbished and converted into ‘Tearoom Moscowa’. 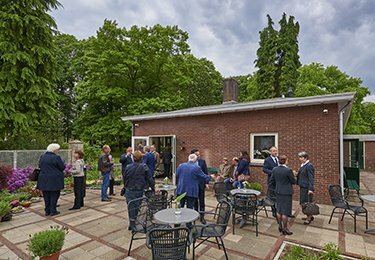 The tearoom – built in 1954 and listed on the municipal historic buildings register – was officially opened by Mr Kaiser, Mayor of Arnhem and Henry Keizer, President & CEO of ‘the Facultatieve Group’, on 3 June 2015. On that occasion, the walking route ‘Walking at Moscowa’ was also revealed. “Moscowa is a popular walking area and we have been frequently reminded of the need for a place where visitors can have something to eat and drink”, André Kruijmer, location manager, explains. “We are pleased that the tearoom will be able to meet that demand, yet visitors can also call in on here with questions about the location of a certain grave for example, or to buy some flowers.” Tearoom Moscowa is opened seven days a week, from 10am to 4pm. Moscowa is worth visiting not only to experience the ambience of a typical Arnhem cemetery, but also from a nature and historical (art) point of view. The memorial park is a popular walking area to many. At the same time it is a park which holds many historical facts. In order to make these more visible, twenty information signs were recently erected in the park and a guide was compiled: ‘Walking at Moscowa’. This booklet, which is available from the new Moscowa Tearoom, leads visitors along paths by numerous monuments and beautiful spots. Moscowa is a (monumental) memorial park with a history dating back as far as 1873. Thanks to the ancient graves and the large diversity in the landscape, the park also holds a high cultural and historic value. 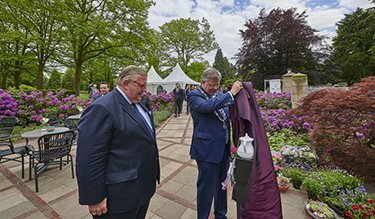 After all, there is a reason why in 2013 Moscowa was the second cemetery in the Netherlands to be admitted to the Association of Significant Cemeteries in Europe (ASCE). Members of this prestigious organization of special cemeteries include the monumental Père-Lachaise in Paris, Montjuic in Barcelona, Cimitero del Verano in Rome and Westerveld in Driehuis (Municipality of Velsen).